Khmelnytsky region is western part of Ukraine. It borders with such regions as Rivne, Zhytomyr, Vinnytsia, Chernivtsi and Ternopil. Khmelnytsky region territory occupies 3.4% of the total area of Ukraine with a population of about 1.3 mln. About 56% of the region population lives in cities and towns. Khmelnytsky region includes 20 rayons, 13 cities, 24 urban villages, 1,414 villages. The largest cities and towns of the region are Khmelnytskyi, Kamianets-Podilskyi, Shepetivka, Netishyn and Slavuta. The economy of the region mostly deals with the energy industry, transport and agriculture. Khmelnytsky region is situated at a historical crossroad of the railway and highway routes connecting Central Europe to Black Sea coast and Russia. The Khmelnytsky nuclear power plant in the city of Netishyn is the most important industrial company of the oblast. There are also such industrial branches as machinery, armament and chemical industries. 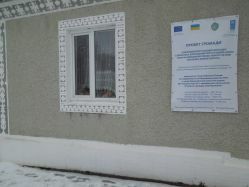 Implementation of the first phase of the EU/UNDP CBA Project commenced in Khmelnytsky region during May 2008. First phase was succeeded by a second phase in July 2011. Over these two phases, more than 40 ths. of men, women and children of the region have benefitted from improvement in 67 schools/kindergartens, 12 health posts, 8 water supply, 5 school buses 8 street-lightning and so on. This happened through joint effort of the citizens, oblast/rayon/local level governments, the CBA Project and the private sponsors. Third phase of the EU/UNDP CBA Project was initiated in Khmelnytsky region with regional launching and signing of MoU which took place on September 17th, 2014. The oblast received a quota of 8 rayons for standard\replication components. Rayons selected for the EU/UNDP CBA Project: Iziaslavskyi, Bilohirskyi, Starosyniavskyi, Novoushytskyi, Vinkovetskyi, Volochyskyi, Shepetivskyi, Chemerovetskyi. Micro projects approved as of 25 March 2016: 28 micro projects (4 – health, 18 – energy saving, 1 – water supply, 5 – energy efficiency). Around 23,900 persons will benefit from implementation of these initiatives. Total budget for the initiatives is approx. UAH 8.6 mln (approx. USD 315,600). The EU/UNDP CBA Project will provide around UAH 5.6 mln (approx. USD 205,500).